Oct. 16, 2012 - PRLog -- The new office humor releases are pitted against bus drivers, computer techs, dentists and doctors and others, which have increased sports art collection to 19 professional occupations. All nineteen occupational workplace humor art pieces are printed on art paper, thus resulting in vivid, pure color and exceptional detail. According to the site’s owner, all the Sports Man Cave Signs are finished with a Black Wood Frame and glass at a nominal cost, and are available for shipment in the Continental United States. We have sports art for nineteen professional occupations. Visit our online store at http://sportsandmancaveart.com/catalog/occupational-humor/. 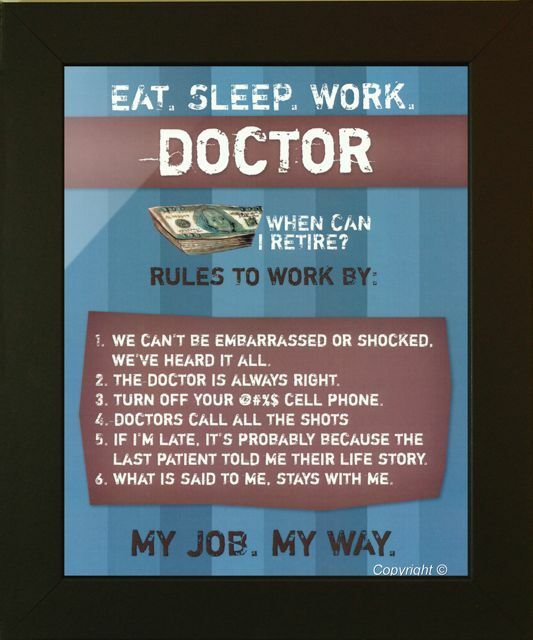 Asked why he thinks people would be interested in these additional pieces of framed occupational humour signs, John pointed to the fact they would make a great Christmas or retirement gift idea for people looking for a new gift for their dad, husband, brother, boyfriend, best friend, co-worker for under $20! There are no other products like this. The additional custom framed workplace office humor framed artwork ((http:/sportsandmancaveart.com), according to John are elegant works of art that are suitable for any workplace office, cubical or den.